Mission Press Kit available here. 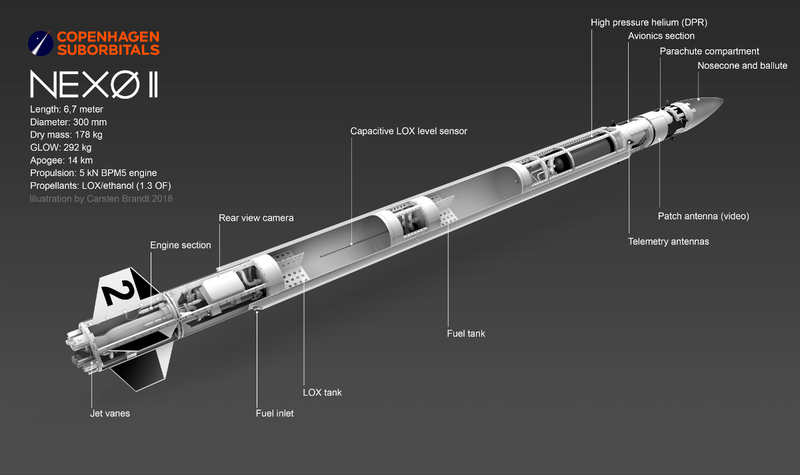 The Nexø II rocket will be the most advanced rocket build and launched by CS so far. The Nexø rocket class is a technology demonstrator in advance of building the significantly bigger Spica rocket that will take our astronaut to space. Thus, Nexø is an important part of the Spica roadmap and the technology developed and used in the Nexø class will be used in the Spica rocket. Nexø II is actively guided by our own custom build Guidance and Navigation Computer (GNC). A set of four graphite jet vanes are used as the Thrust Vector Control system (TVC) commanded by the GNC. The system is identical to the one successfully used on the Nexø I mission. For more about the Nexø II Mission, visit here.